As a gamer and a teacher I had a connecting point with many of my students. Discussing loot or an upcoming raid always gave us something to talk about outside of class and allowed me to develop a rapport with students who often didn’t fit typical high school molds. My classroom became their hangout during break and lunch. I was always amazed at how easily they recalled minute trivia about the game world, often quoting specific statistics about a piece of gear or their character’s game statistics. Their ability to think critically about a particular strategy in a boss fight blew me away. These were not necessarily honors-level students, either. Sometimes my poorer-performing students would amaze me with what they knew about the game. 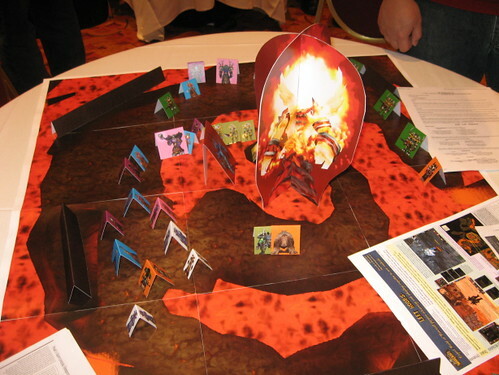 Why couldn’t we use a game like this in a school setting? Why not, indeed! What would it look like to have a computer lab full of students all playing World of Warcraft together with their teacher (projected on the screen at front, of course). I finally took the time to write down many of the ideas that I’d been formulating. “There are some real lessons to be taught in all of this!” I shared my ideas with one of the coolest and most forward thinking gamer/educators I’d met at the 2008 Games Learning and Society Conference, Peggy Sheehy. Peggy’s feedback was very positive and she wanted to share it. Then I thought, “surely we’re not alone.” I know there are other World of Warcraft playing teachers out there (I know because I have two from my district in my guild). So, I migrated the project to a Wiki format because I want others to share and collaborate. Peggy has recently shared this with the RezEd community, an online community of virtual world enthusiasts and educators. 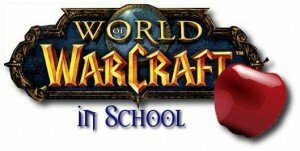 I’ve even found another, avid World of Warcraft teacher in my own state who’s been adding her ideas for World of Warcraft lessons to the wiki. It’s very exciting to see these ideas gaining traction! In Math – Damager Per Second (DPS) Analysis: Acquire two different weapons in world used by your character’s class. Using the targetting dummies in a capital city, find the average damage over time of each weapon and plot the data on a graph. Try the same experiment again, this time with gear that changes your character’s agility, strength, attack power, or other melee-related statistic. Graph the new data. What’s the relationship between the statistic you tested and the DPS output? In Writing – Design a Quest Chain – Design a quest chain, based on your experience with other quests in the game. The chain must involve at least two different areas in the zone and have at least five steps. Write all the dialogue that the NPCs involved in the quest would say. Make sure you indicate the quest requirements and the steps involved in the quest. You can research quest chains using one of the online quest helper databases like Wowwiki, Thotbott, etc. 21st-Century Skills – Machinima (a movie or film created using a video game or virtual world): Create and edit a video that tells a story in game. Create and edit a video that uses the game to address a social issue. Use your characters to tell the story. Write a script and create a storyboard for your movie. Post your movie to a collaborative video-sharing site (YouTube, TeacherTube, SchoolTube, etc.). Promote your video through your social network. So, how would all of this be implemented? That’s up to the teacher. I’m hoping to use this as an after school program targeting at-risk students, but the lessons we’re developing are designed to be very granular and implementation is flexible. I’m hoping to implement this in the coming school year. Overall, the project is still in the early formative stages. If you’d like more information or would be interested in contributing your expertise, visit http://wowinschool.pbworks.com. World of Warcraft on the iPhone? Did you read this article by Business Week? The authors outline features of World of Warcraft that make it a good model for encouraging innovation in business. Ideas like: “Keep Raising the Bar” and “Encourage Frequent and Rigorous Performance Feedback” are just a few lessons they take from the game. What first stood out to me as I read this was how easily you could substitute the ideas of “corporate” and “business” in this article with “education” and “the classroom.” Read it and see what you think! This was a great fireside chat session and really, a great close to my time at GLS 2008. Elizabeth is is the director of the Lab for Social Computing at the Rochester Institute of Technology and a gamer (three level 70’s in WoW!). Lane, 14, is Elizabeth’s son, and was influential in Linden Lab’s creation of a teen grid for Second Life. The discussion revolved around the good things that often emerge as a result of a player’s immersion into video games. 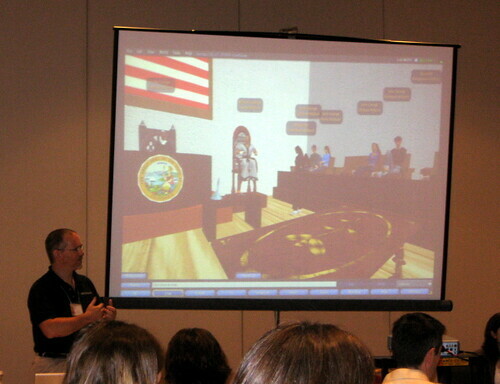 Lane, for example, developed an interest in 3D modeling and programming as a result of his experiences in Second Life. This has been one of my biggest arguments in favor of video games, and I’ll simply cite my earlier post, “10 Educational Things I Learned From Playing MMORPG’s.” Again, I encourage readers to add to this list! Another discussion that emerged during this chat was the critical need for parents to be involved in their child’s life, specifically their gaming life. Parents, if your kids are playing video games, by all means, play with them! Julian Dibbell presented “Sympathy for the Griefer: MOOrape, Lulz Cubes, and Other Lessons From the First 2 Decades of Online Sociopathy,” a fascinating look at those who are “spoil sports” in virtual worlds/games. This session tapped into some very strange territory regarding play and the “rules,” spoken and unspoken, surrounding play and interaction online. Fascinating! Following Julian, Lisa Nakamura presented “Don’t Hate the Player, Hate the Game: The Racialization of Labor in World of Warcraft,” detailing her research in the emerging stereotypes surrounding “Gold Farmers” in MMO’s like World of Warcraft. It was a fascinating discussion. I also had the opportunity earlier in the day to be a part of an informal discussion between Lisa and others regarding the phenomenon of gold farming and how the player community views it. In my early MMO experiences, such as EverQuest and Dark Age of Camelot, the player community, in my opinion, had much stronger views against the practice of gold buying, though I think the player base of World of Warcraft has a much looser view of the practice of buying gold. That’s ironic and hypocritical, of course, in light of the fact that they shun the farmers. I’ve never seen the need to buy gold in WoW, especially since the upper end of the economy is so inflated with daily quests and easy money. Edd Schneider’s presentation on “The Temptation of Virtual Misanthropy: User Exploration in Virtual Environments,” was both funny and fascinating. Edd’s research had folks who’d never played Grand Theft Auto, try the game, however, they were told that their role was as a fireman whose job it was to protect the city from fire outbreaks. Before playing, players were warned that they should be careful while driving their firetruck as to avoid running over pedestrians, that the police would arrest them if they did, and that there existed criminals in the game that might try to subvert them from their tasks. Considering the nature of the GTA series, this is hillarious. What’s even more fascinating is how long it took before these players killed their first person, either accidentally or intentionally. Academics are no longer simply researching the games externally, but now immersing themselves in it. There has possibly been a “chaging of the guard” due to the fact that many researchers today have grown up playing video games. When explaining research results, there are sometimes problems resulting from an audiences lack of experience or knowledge of games like MMOs. Find analogs to help explain to non-gamers! Quest logs are learning management systems! A video explaining MMOs ground up and targeted to teachers or academics who’ve had no experience with MMOs is needed. Candace Barriteau Phaire showed her work with students in mathematics using popular sports games like Madden 08. Students studied athlete statistics, formed their teams, played their teams against each other and studied the underlying math. What a great integration! Maggie Hommel explained her work with the Park Ridge Public Library in Illinois. One of the most interesting things they did is that they began to check out games for consoles like the XBox. Their board feared that book checkouts would decline and in fact, they increased. Libraries seem a promising place to integrate gaming in after school programs. Dona Cady explained her work with community college students using World of Warcraft, Second Life, and Active Worlds to supplement her English Composition courses. Students wrote stories from the perspective of their characters. Very cool. Tripp Robbins and Bill Chamberlain outlined their proposal for a virtual world development environment while they also demoed their work with Neverwinter Nights Two. “We can’t keep trying to fit square pegs into round holes,” Tripp said, referring to our attempts to use existing development environments like NWN2 for educational purposes. Though they do work, the man-hours needed for development and the learning curve are daunting. They’re prosing a new project at: http://newnexus.org. Great idea! Hope it flies!